Measuring the flow rate of blow-by gases as they flow out of the crankcase vent is an effective way to monitor piston-ring sealing, lubricant performance, and crankcase ventilation systems. The VF563 is the flow meter of choice for measurement of crankcase blow-by gases in engine emissions testing applications. J-TEC Associates Blow-By meters provide all the advantages of vortex shedding flow meters, in a design that is perfect for rugged applications, such as engine dynamometer testing. The J-TEC design incorporates a small strut, which offers minimal flow restriction, for high accuracy over an extended range. Each meter is individually calibrated to NIST traceable standards. 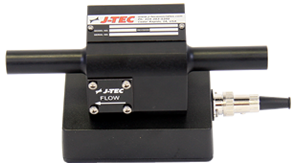 J-TEC Blow-By flow meters have no moving parts, so they are rugged and trouble-free.